Abstract: NOAA's Office of Education’s Educational Partnership Program (EPP) allows NOAA mentor scientists to submit opportunities for student participation. Once selected, the NOAA opportunity is circulated among students associated with four focused centers and corresponding NOAA line offices; the Environmental Cooperative Science Center (ECSC) / National Ocean Service (NOS), the NOAA Center for Atmospheric Science (NCAS) / National Weather Service (NWS), the Cooperative Remote Sensing Science and Technology (CREST) / National Environmental Satellite Data and Information Service (NESDIS), and the Living Marine Resources Cooperative Science Center (LMRCSC) / National Marine Fisheries Service (NMFS). We present four examples of successful partnerships between NOAA coral science projects in Hawai'i and Puerto Rico and EPP-MSI students and how these projects address the goals of bridging science to management and policySummary: Examples of coral projects that were possible by integrating students selected from NOAA's Education Partnership Program into the NOAA project team. 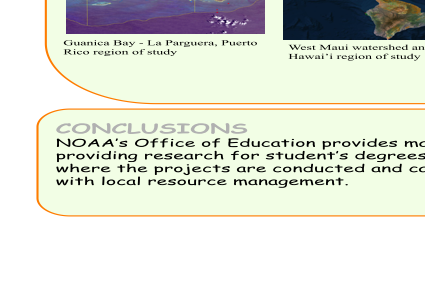 Briefly described is a new project by the NOAA mentor whereby we are working with Akamai program students. The NOAA mentor's projects range from biochemical methods, instrumentation measurement of physiology, remote sensing and geographical information systems, all of which involve field work, thus providing the student with a broad experience.References: Aswani, S., P.J. Mumby, A.C. Baker, P. Christie, L.J. McCook, R.S. Steneck, R.H. Richmond. 2015 Scientific frontiers in the management of coral reefs. Frontiers in Marine Science 2, Article 50: 1-13.